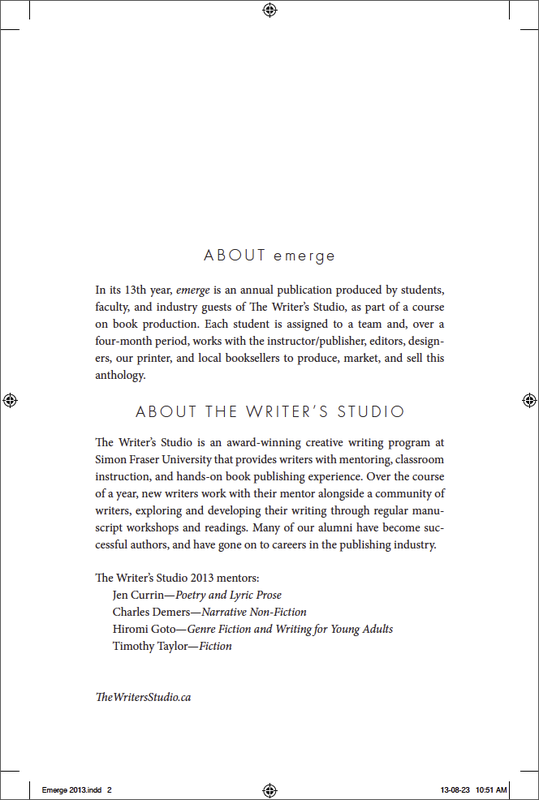 The “about emerge” page contains information about the anthology and The Writer’s Studio. It introduces readers to the anthology and TWS. In its 13th year, emerge is an annual publication produced by students, faculty, and industry guests of The Writer’s Studio, as part of a course on book production. Each student is assigned to a team and, over a four-month period, works with the instructor/publisher, editors, designers, our printer, and local booksellers to produce, market, and sell this anthology. writers, exploring and developing their writing through regular manuscript workshops and readings. Many of our alumni have become successful authors, and have gone on to careers in the publishing industry.